A stream of bluish water bends towards the east and cuts the peninsula into the shape of a gourd the tropical rain forest is a forest biological system with the most abundant life forms on earth and Xishuangbanna is such a survived oasis on the North Tropic and the only large stretch of tropical rain forest in China. Xishuangbanna Tropical Botanical Garden (XTBG) (xī shuāng bǎn nà rè dài zhí wù yuán 西双版纳热带植物园) is the largest manmade botanical garden with the richest life forms established on this aftermost stretch rain forest on the Chinese territory. Founded in 1959, Xishuangbanna Tropical Botanical Garden, Chinese Academy of Sciences (CAS) is located at 21º55' N, 101º15'E, covering an area of 1,100 ha. Over 13,000 species of tropical plants are well preserved in its 35 living collections. XTBG is a comprehensive research institution engaged in biodiversity conservation and sustainable uses of plant resources, focusing on forest ecosystem ecology, conservation biology and resource plant development. One of the tributaries of the Asian Danube Mekong River - the Luosuo River cuts the topography here into Gourd peninsula (hú lú dǎo 葫芦岛) in Menglun Town (měng lún zhèn 勐仑镇), Mengla County (měng là xiàn 勐腊县) of Xishuangbanna. The peninsula situates in the northern edge of the Southeast Asian tropical areas, and the natural condition there is quite favorable; therefore, large blocks of rain forests are preserved in this part. These make the place become an ideal place for botanical research, plant seed resource preservation, technical development, science popularization and tourism. 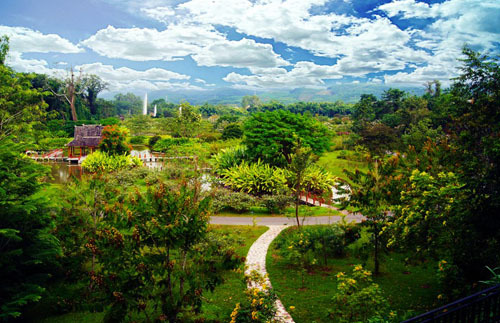 The world famous Xishuangbanna Tropical Botanical Garden under the Chinese Academy of Sciences just selects its site on this beautiful island, and makes the island enjoy fantastic landscapes like the legendary teach orchard. In 1959, a famous Chinese botanist, Professor Cai Xitao (cài xī táo 蔡希陶), led on a group of young scientific researchers across the river on a bamboo boat; they broke open a way through bramble and thistle, overcame numerous difficulties and founded the first tropical botanical garden in Xishuangbanna Tropical Botanical Garden. Forty years have passed in a flash since then. Through more than 40 years hard struggles, backbreaking labors and selfless contributions of three generations of scientists on the Gourd Island, a botanical garden integrating functions such as botanical research, plant seed resource preservation, technical development, science popularization and tourism into one has been now brought into being on the original wild island. 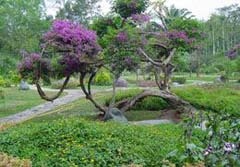 On this land of 90 hectares, the scientific researchers have constructed more than 20 gardens such as the Garden of Famous Trees Planted by Celebrities, the National Tree and Flower Garden, the Garden of National Plants, the Garden of Palms, and the Garden of Shady Plants etc. Nowadays, nearly 5000 varieties of tropical plants are growing prosperously in the garden; tall trees and short flowers straw in random and distribute in groups in each specialized garden. The trees in the Tropical Botanical Garden are luxuriantly green and characterizing a spring day all the year round. Scenes such as strangling phenomenon, flowers on aged trunks, one-tree forest, flying huge vines and garden in the air are frequently encountered in the garden. Flowering of iron trees, the color-changing flowers, mysterious fruits and dancing grasses can be met almost everywhere. Besides, within the garden, the scientific workers also raise some rare local animals such as peacocks and gibbons; the animals and plants live harmoniously in this artificial tropical garden. What is particularly worth mentioning is that, in the comparatively well-protected 90 hectares of rain forests, there are altogether more than 2000 local plant species, which account for 40% of the plants in Xishuangbanna. Moreover, the botanical garden also transplants more than 400 varieties of plants of South Yunnan and 56 varieties of key national protection plants in this garden. These plants and animals together make the garden become an important base for botanical research, plant seed resource preservation, technical development, and science popularization; besides, the valleys and trenches here transverses in lengths and breadth and make the biotope particularly complex, and gives the botanical garden peculiar rain forest features. The visitors are more often than not relaxed and happy after taking a walk around this beautiful place. The peculiar rain forest landscapes, the rain forest sceneries, and national forest cultures combine organically on the Gourd Island, and they bring out the best each other; therefore, they sufficiently represents the harmony in-between man and nature. 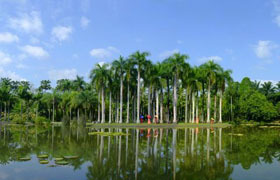 Each year, the tropical garden would attract hundreds of thousands Chinese and foreign experts, scholars, and tourists to come here for investigations, academic exchanges and sightseeing. Some foreign leaders, members of foreign royal families, the ambassadors of many countries, the major officials of some international organizations, and some famous international scholars who have come to the gourd Island for investigations and sightseeing all marveled at such an outstanding research institute that lies on the Southwest Chinese borderline, and all of them spoke highly of the development of the tropical botanical garden and expressed their wishes for constructing the garden into the first-rate botanical gardens of the world. Cycads belong to a group of remnant seed plants which are called living fossils. They are of great importance for study on paleoclimate, paleogeography and flora evolution in addition to their horticultural ornamental and economic values. Almost all cycads have been listed as key protected plants. Covering an area of 3.2 ha, the Cycad Garden is home to most of the cycad species native to China and some species from other tropical regions. Vine garden covers an area of 7.3 ha with more than 400 vine species.According to vine plant's climbing adaptations and display functions, the garden is divided into 4 display sections, including ornamental vines, nature ecology vines, population vine, and hanging vine. The public can enjoy a wide variety of vine plants' ways of lives. It's also a good platform for scientific research and environmental education. 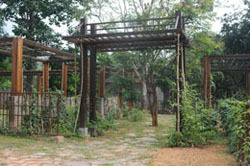 The garden for energy plant covers an area of 13 acres. According to the history of plant’s usage by human, the garden comprises of 5 functional parts which collected plants for firewood, starch, textile, oil and hydrocarbon. The garden has the energy plants which are widely used or have a great potential for development in tropical and subtropical areas. And now this garden is home to more than 350 species in 50 plant families. In this garden, visitors can enjoy seeing the different styles of landscapes, ornamental elements, energy plant diversity. It does not only show the relationship between energy plants and human beings but also provide a good platform for scientific research and exploitation of economic plants. Occupying an area of 80 hectares, the tropical rainforest spot is mainly used for ex-and in-situ conservation of rare and endangered tropical plant species. It is divided into seven parts, including ginger collection, aroid collection, orchid collection, fern collection, and wild flower garden etc.. It has harbored more than 2000 species, including more than 100 rare and endangered species. The core zone of this spot is a primary tropical rain forest, exhibit the tropical rainforest characteristics, such as plank buttress, strangler figs, cauliflory, aerial garden, big liana hanging over the trees etc.. You can also see Pellacalyx yunnanensis and Pandanus furcatusthe which imply the geological transformation history of Xishuangbana. After 30 years' protection and construction, this area has become an integrated platform for plant biodiversity conservation, scientific research and environmental education. Lying due east of the gourd-shaped, the Green Stone Forest is home to a lush limestone seasonal rain-forest. Encompassing a great diversity of habitat and topography, the forest is home to more than 1,000 vascular plant species and a wide array wildlife. It covers an area of 225 ha and its forest coverage is above 90 %. 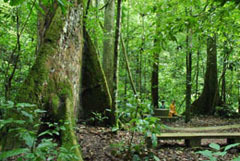 On the slopes of the forest, plants and unique stones complement one another, forming a picturesque scenery described as “forest growing on the stone.” As the original habitat of hornbills, monkeys, gibbons and orchids, the Green Stone Forest now serves as an important site for reintroduction of these rare animal and plant species. Have you ever seen an orchid higher than a man? Possibly most people’s answer is “No”. A few days ago, a population of huge leafless orchid, Aphyllorchis caudate, was amazingly found here. The population is composed of more than 100 individuals. The tallest individual reaches 1.97 meters, much higher than what is described in Flora of China. 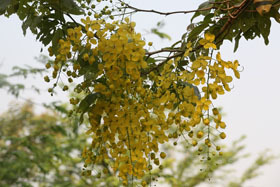 One individual has 60 flowered inflorescences, which is the most among the population they have found. 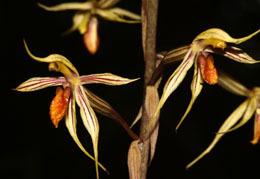 Aphyllorchis caudate is found in Southeast Asia, South Asia, and Australia in thick decaying humus in dense forests at elevations around 1050 to 1750 meters. It is a terrestrial orchid with no leaves. Located at the main entrance of XTBG, Flower Garden covers an area of 25 ha and has a collection of 600 species and varieties of tropical flowers. It is an integrative garden incorporating landscaping, horticultural display, public education, species conservation and recreation as well. Embellished with blossoming flowers and waters, it is always ornamented by splendid colors. 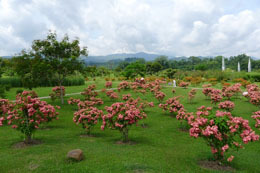 In June, the Flower Garden in XTBG has been decorated with various plants in bloom. 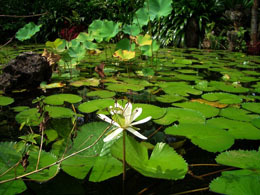 A few examples are lotus flowers, iris, hibiscus, bugambilia, golden lotus banana, and heliconia. The Flower Garden is made more eye-catching for the natural landscape integrated with such gardening ornaments as flower stands, corridors, waterside pavilions, flower harbors, winding interconnecting pathways over water, fountains, and waterfalls. With an area of 2 ha, the Medicinal Plant Garden is home to over 400 medicinal plants from tropical and south subtropical regions. It is divided into many sections featured with tropical medicine, ethnic medicine, traditional Chinese medicine and natural medicine respectively. Some ethnic medicinal plants reflecting the interactions between local ethnic minorities like Dai (dǎi 傣), Hani (hā ní 哈尼), Jinuo (jī nuò 基诺) and the tropical rainforests are on display. 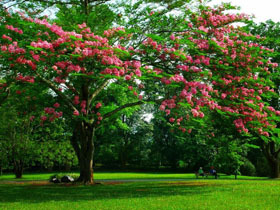 Most countries in the world have their own national trees and flowers. They are the symbol of a country and reflecting each country’s culture, spirit, value as well asaethestic standard. 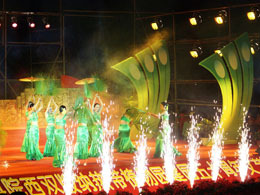 National Trees and Flowers Collection was established in 1999 to celebrate Expo’99, the World Horticultural Exposition. 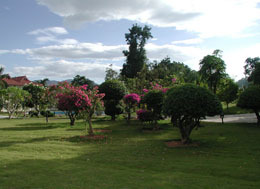 In the area of 1.3 ha, there are 52 national trees and flowers from 64 countries of six continents, such as national flower of Burma - prince of orange (Ixora chinensis), national flower of Laos - frangipani (Plumeria rubra), national flower of Libya - pomegranate, the national flower of Madagascan - royal Poinciana (Delonix regia), the national flower of Russia - the sunflower, and the national flower of Belgium - azalea, etc. 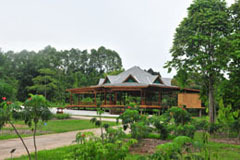 XTBG is one of the designated institutions to undertake environmental education to the public. Being a A class tourist destination in China, each year XTBG attracts a considerable number of tourists with anxious desire to capture knowledge on plants and environment. All the 70 tour guides are recruited from local villages; most of them are ethnic minorities. After professional training, they could act as the “ambassadresses” of the Garden, while delivering scientific messages to visitors. They can also learn from their day-to-day experiences and bring this knowledge back to their villages. Although they usually work for about 5 years in the Garden, the experience could be life long, even to the benefit of their future generations. For celebration activities, the tour guides usually make performances like dancing and singing.